AHRI’s regulatory activities support the core functions of the association. Staff monitors and contributes to rulemakings in the U.S. and abroad, from federal and state agency mandates to local building codes, to ensure that industry priorities are considered in the regulatory process. AHRI’s regulatory staff is relied upon for their technical expertise and thorough understanding of the rulemaking process. Please review the AHRI Update for the latest news on pending regulations. The Department of Energy (DOE): The DOE ensures success and security in the United States’ energy sector by addressing its energy, environmental, and nuclear challenges. Its Building Technologies Office strives to develop new and innovative methods to improve energy efficiency in homes and businesses nationwide. DOE’s Building Technologies Office sets test procedures and implements energy conservation standards for several residential and commercial products represented by AHRI. The Environmental Protection Agency (EPA): The EPA’s mission is to protect human health and the environment by developing and enforcing regulations, conducting and funding research, and raising public awareness of relevant issues. 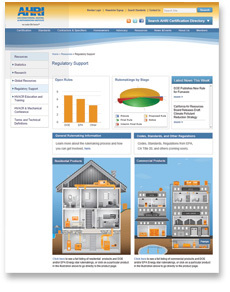 It oversees the United States’ ENERGY STAR program, which monitors and regulates energy efficiency levels for a wide variety of appliances and products, including HVACR and water heating technologies. EPA is responsible for programs that protect the stratospheric ozone layer. It has issued regulations under section 608 of the Clean Air Act to minimize emissions of refrigerants. EPA is also authorized to identify and publish lists of acceptable and unacceptable substitutes for ozone depleting refrigerants and manages this effort through its The Significant New Alternatives Policy (SNAP) Program. The Federal Trade Commission (FTC): The FTC is an independent agency that prevents anticompetitive or unfair business practices while raising public awareness of consumer choices and the competitive process. In addition, it works to ensure that published rules and regulations do not place undue burden on businesses that might hamper the nation’s competitive environment. AHRI has worked with FTC staff on several aspects of FTC’s Energy Labeling Rule. The California Energy Commission (CEC): The CEC is California’s primary energy policy and planning agency, which works to forecast future energy needs, as well as promoting energy efficiency and conservation by setting appliance and building efficiency standards. Natural Resources Canada (NRCan): NRCan oversees the development and use of Canada’s natural resources. In addition, it shares best practices and technologies to meet the country’s global commitments and ensure environmental sustainability, including coordination with the United States’ ENERGY STAR program. The South Coast Air Quality Management District (South Coast AQMD): South Coast AQMD is the air pollution control agency for the southern California area, including Orange County and Los Angeles. It works to control emissions from stationary sources of air pollution such as power plants, refineries, and gas stations, as well as consumer products that can evaporate into the air including house paint and varnish. ASHRAE is a building technology society with more than 54,000 members worldwide. AHRI staff provides input to ASHRAE’s development of method of test standards and building codes that are of importance to the industry. In particular, regulatory staff contributes to ASHRAE 90.1, ASHRAE 90.2, and ASHRAE 189.1. The International Code Council manages a family of codes, including fire, mechanical, building and energy. AHRI staff participates in ICC’s code development process. The Consortium for Energy Efficiency (CEE) is an organization that influences markets to accelerate uptake of increasingly efficient goods and services. CEE’s membership predominantly includes electric and gas efficiency program administrators. CEE helps its members to partner not only with each other, but also with industry, trade associations, and government agencies. AHRI has participated in the development of several CEE high-efficiency specifications for residential and commercial equipment. Visit AHRI’s Regulatory Support pages for information on regulations from the Department of Energy, the Environmental Protection Agency, California, and more.